At least one spouse must live in Nebraska for 12 months before filing for divorce, or if you were married in Nebraska and at least one of you has lived there continuously since the wedding, you can file for divorce even if neither of you has lived in-state for 12 months yet. If there's no hope that your marriage can be saved, you have met the requirements for a no-fault divorce on the grounds that the marriage is irretrievably broken. All divorces in Nebraska are filed at the District Court Clerk's office in the county where either spouse lives. Serving your spouse in Nebraska is very easy. The Plaintiff just hand-delivers a copy of the divorce papers to the Defendant. Then, the Defendant signs a one-page form acknowledging receipt of the papers--no notarization needed. This allows you to avoid the expense of hiring a process server and spares your spouse the hassle and embarrassment of being formally served with divorce papers by the Sheriff. You can get your Decree signed by the judge in as little as 90 days. 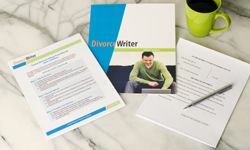 DivorceWriter provides forms specific to the state of Nebraska and offers a money back guarantee if your documents are not accepted by the Court. You have qualified to use DivorceWriter to complete your Nebraska divorce papers online. Select "Continue" to start the interview.